How do I skip questions? To skip to questions based on previous question responses involves the following. Setting a Logic and Action on that page that skips to the end of the survey, if the "No" answer is given. So to illustrate what is going on, let's create a survey that has three questions. We will skip the second question if the respondent answers the first question "No". The first question will ask if the respondent is a current student. If the answer is "No" it will skip to the last question which is a general question for all respondents which will ask if they are planning on coming to the performance. Step 1 - Create A Survey. Hit the button that says "New Survey"
Step 2 - Click on the Questions tab. 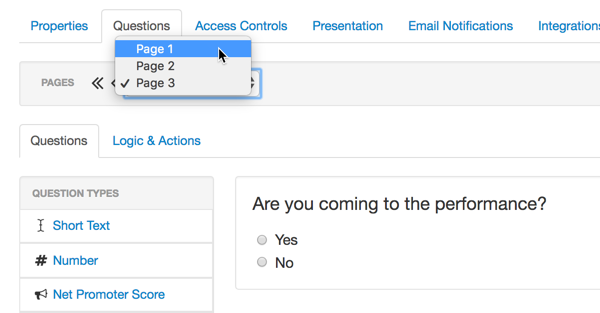 Add a "Radio Button" by dragging and dropping the "Radio Buttons" question from left to right onto the main area. 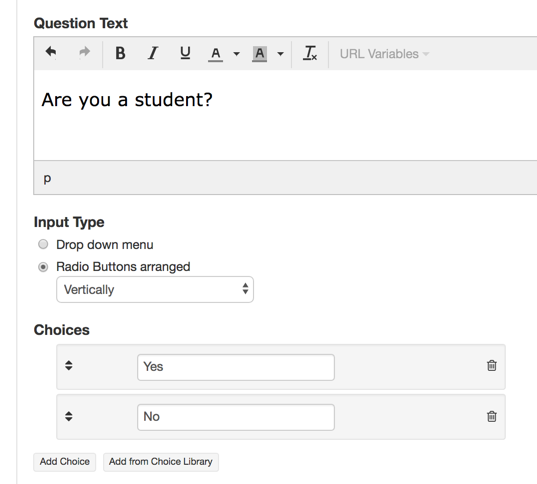 Set the Question Text to "Are you a student? 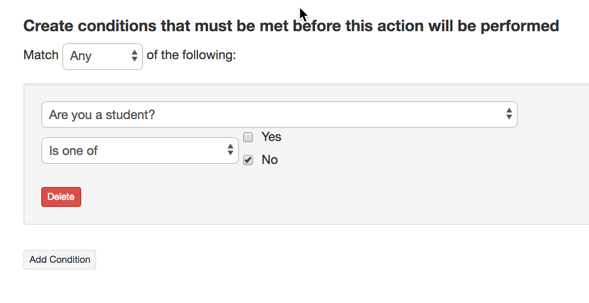 "/ Add the choices of "Yes" and "No" by clicking "Add Choice". Scroll to the bottom and click "Add". Create Second Page - Click on the button that says "Insert Page After". This will create your second page. On the second page, add the question that is meant only if the person answers "Yes" to being a student. So we will ask what year they are in school, Freshman, Sophomore, Junior or Senior. This is another radio button question. Create the Third Page - Click on the button that says "Insert Page After" again. This will create the third page on which we will add the final question. Create the final question on the third page asking if they will be coming to the performance. This is a question that all survey respondents can take. Choose "Radio Buttons" and drag into the main area. Let the Question Text as "Will you be coming to the performance?" and add the options "Yes" and "No". Now it is time to set the Logic that will skip the second question if they are not a student. Do to this go back to the first page using the page navigation area. Click on the "Logic and Actions" tab- What we are doing next is setting up a Logic that says if they respondent says they are not a student we want them to skip page 2, which has the question that asks what level of student they are. Hit "Add a New Action"
From the dropdown choose "Are you a student?". Then select "No". Scroll down and Step 3 and click "Jump to" and select "Page 3". Then hit "Save Changes"
You are done! You can preview your new survey or start it when you are ready for people to take it.